Rosemary Nelson (née Magee; 4 September 1958 – 15 March 1999) was a prominent Irish human rights solicitor who was assassinated by an Ulster loyalist paramilitary group in 1999. A bomb exploded under her car at her home in Lurgan, Northern Ireland; the Red Hand Defenders claimed responsibility. Allegations that the British state security forces were involved in her killing led to a public inquiry. It found no evidence that state forces directly facilitated her murder, but could not exclude the possibility that individual members had helped the perpetrators. It said that the Royal Ulster Constabulary (RUC) failed to protect her and that she had been publicly threatened and assaulted by officers, which helped legitimize her as a target. Rosemary Nelson, née Magee, obtained her law degree at Queens University, Belfast (QUB). She worked with other solicitors for a number of years before opening her own practice. Nelson represented clients in a number of high-profile cases (including Michael Caraher, one of the South Armagh Snipers, as well as a republican paramilitary accused of killing two RUC officers. She also represented the Garvaghy Road Residents’ Coalition in nearby Portadown in the long-running Drumcree conflict against the Orange Order and RUC. Nelson claimed she had received death threats from members of the RUC as a result of her legal work. Some RUC officers made abusive and threatening remarks about Nelson to her clients, which became publicly known. In 1998, the United Nations Special Rapporteur on the Independence of Judges and Solicitors, Param Cumaraswamy, noted these threats in his annual report, and stated in a television interview that he believed her life could be in danger. He made recommendations to the British government concerning threats from police against Solicitors, which were not acted upon. Later that year, Nelson testified before a committee of the United States Congress investigating human rights in Northern Ireland, confirming that death threats had been made against her and her three children. Nelson was assassinated, at the age of 40, by a car bomb outside her home in Lurgan, County Armagh, in 1999. A loyalist paramilitary group calling itself the Red Hand Defenders claimed responsibility for the killing. She was survived by her husband and their three children. In 2004, the Cory Collusion Inquiry recommended that the UK Government hold an inquiry into the circumstances of Nelson’s death. Nelson was posthumously awarded the Train Foundation‘s Civil Courage Prize, which recognises “extraordinary heroes of conscience”. The resulting inquiry into her assassination opened at the Craigavon Civic Centre, Craigavon, County Armagh, in April 2005. In September 2006 the British Security Service MI5 announced it would be represented at the inquiry. This move provoked criticism from Nelson’s family, who reportedly expressed concerns that MI5 would remove sensitive or classified information. The results of the inquiry were published on 23 May 2011. 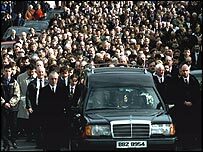 The inquiry found no evidence that state agencies (the RUC, British Army and MI5) had “directly facilitated” her murder, but “could not exclude the possibility” that individual members had helped the perpetrators. It found that state agencies had failed to protect her and that some RUC intelligence about her had ‘leaked’. Both of these, it said, increased the danger to her life. The report also stated that RUC officers had publicly abused and assaulted her in 1997, and made threatening remarks about her to her clients, which became publicly known. It concluded that this helped “legitimise her as a target in the eyes of loyalist terrorists”.